Hi, Guys, this is Vedant and today am going to tell you that how you can take an Awesome 3d screenshot from your phone. 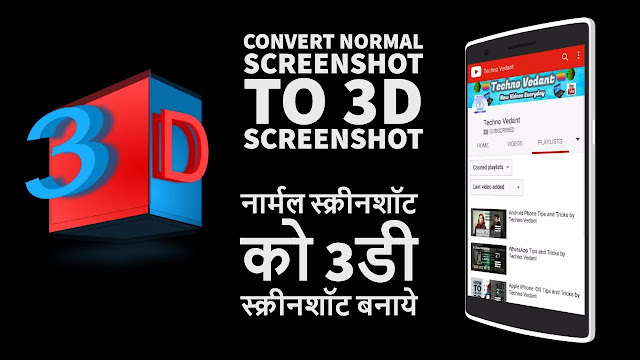 How To Take Awesome 3D Screenshots On Android, Convert Normal Screenshot to 3D Screenshot 2017 and please don't forget to Like, Share, Comment and Subscribe to our Techno Vedant Channel for more videos. Screener lets you stick screenshots into device frames and add backgrounds and effects in a snap. Promote your app, wallpaper or simply your homescreen - easier than ever before, without the need of any PC software. You need help or have problems? Email help@toastco.de - we're happy to help!